Such a creative Cloud-Flower Mount rainy Pot product, which can makes your daily watering plants and flowers more interesting and educational. It is a little piece of cute art for indoor decoration. 1.Pour soil into the red flower pot. 2. Put some moderate water into the clouds. 3. Allow the soil within to be watered by raindrops. 4.Plant the seed or flowers in the pot. 5. Then enjoy the view of raindrops. ***Best choice as a gift for friends, colleague, classmates, kids and so on. 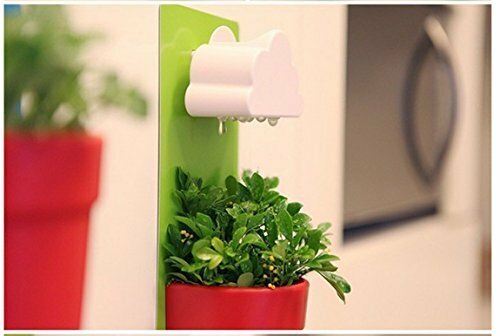 Amazing designed with the scene of raindrop for your plant when you pour water from the top cloud, makes a great interior decoration. Simple but very smart designed on the button of the pot with a rubber plug, which can check the water levels.Such a little piece of cute art for indoor walls, office and home tables. Note:There are no seeds and no soil in the box.Highly recommend as a gift for family members and friends. If you have any questions about this product by SZAT, contact us by completing and submitting the form below. If you are looking for a specif part number, please include it with your message.